For Dan Van Allen, the decision to move into the Hollins Market neighborhood was easy. He was anxious to own a home, and a traditional Baltimore rowhouse was available there for $10,000. After looking at a few other communities, Van Allen moved into the Southwest Baltimore neighborhood in 1980 from the D.C. area. He was drawn to the neighborhood's historic feel and its proximity to downtown and Hollins Market, one of the city's oldest markets. But in the nearly 25 years that Van Allen has lived there, he has watched his community struggle with drugs, poverty and vacant housing as people choose to leave the area. Recently, though, the neighborhood association has pushed for reform while plans for a nearby biotechnology park could spur revitalization. About 25 percent of the more than 1,100 Hollins Market houses are vacant, according to the 2000 Census. And one-third of the residents of this area are impoverished, data show. A family of four, including two children, is considered in poverty if the family's total income was less than $17,000 when census data were compiled five years ago. "It's not the worst area," said Van Allen, 51, who restores furniture. "It's definitely a lot better than some of the neighborhoods behind the Avenue Market." Van Allen is part of a growing effort to improve his neighborhood. For the past 18 years, he has helped organize the Sowebohemian Arts Festival, an annual arts show that draws visitors to the neighborhood. He also is president of the Arabber Preservation Society, a volunteer group that supports the city's colorful horse-cart food vendors. Michael Dannenberg, a 10-year resident, also is committed to reviving his community. As president of the neighborhood association, Dannenberg helped form a partnership six months ago with nearby treatment centers. The centers run group homes in the neighborhood and help spruce up community properties. In another project, the neighborhood association gathered comments and concerns from a two-year survey of 300 residents. Dannenberg said some residents were worried about vacant housing, while others said there aren't enough activities for children. "There were areas of concern with drugs and crime but [topics] changed from what part of the neighborhood we were surveying," said Dannenberg, 53. Association members will present these comments and seek solutions at a public meeting this month. Dannenberg said he also has seen "positive things" with the University of Maryland biotech park project. The university broke ground last month on the BioPark, which will replace some of the area's vacant housing with research firms. Residents say they hope the project will spark a west-side renaissance. "As the university invests more in that area, you're certainly going to see the housing stock rise," said Daniel Motz, a sales associate with Coldwell Banker Residential Brokerage. "People are always looking for the next great area. There's lots of positive signs that Hollins Market could be one of those areas." Twenty-five Hollins Market units sold last year, little change from the previous two years, according to figures from Live Baltimore, the nonprofit group. The average sales price for a home in this area is $48,127, according to the Metropolitan Regional Information Systems Inc., a Rockville-based real estate company that tracks these sales. Motz said the potential for Hollins Market homes is upward of $100,000, but the appearance of some properties decreases home values. Only rowhouses make up the neighborhood, Motz said, and vacant housing may deter potential homeowners. Eric Holcomb, a one-year resident in the early 1990s, said many of the restaurants and shops that were there 10 years ago have since closed. But Holcomb said he sees renewed interest with the university and neighborhood redevelopment projects. "That whole area is starting to become reinvested again," said Holcomb, a city historic preservation planner. "It's been through hard times." Holcomb said part of the neighborhood's appeal is Hollins Market at 26 S. Arlington St. Established in 1835, the market was named for the Hollins family, owners of land west of Baltimore. It is the city's oldest market structure still in use, according to the Commission for Historical and Architectural Preservation. A variety of vendors line the aisles of the indoor market. Shoppers often go there for fresh poultry and produce. 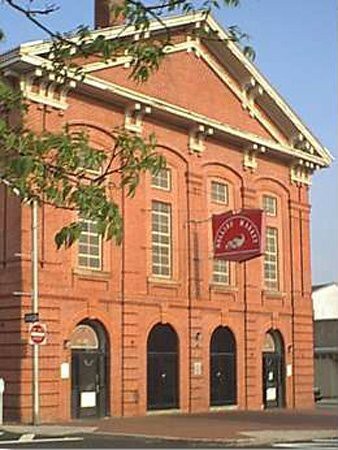 The venue saw decreased interest in the 1950s and 1960s, when the upper story was shut down, but a 1977 renovation boosted its popularity, according to A Guide to Baltimore Architecture. The 1990 movie Avalon showcases the market. "The people who live here are attracted to the market I think because as a shopping experience, it's unlike going to Safeway or a typical supermarket," said Richard Pelletier, a free-lance writer who lives a few blocks away in the Union Square neighborhood. Van Allen considered moving from his longtime home, but said the neighborhood's cultural appeal outweighs some of its problems. His home recently was appraised at $20,000, and he wants to continue to invest in his neighborhood. "This is a perfect place for me," Van Allen said.